Recreational/Team Open Gyms are designed for gymnasts ages 6 through 14 to enjoy free time in the gym to practice their favorite skills and hang with their friends in a safe and energy filled environment. Jumping on the trampolines and into the foam pit a must! Cost -$10 SCGC Members, $ 15 Non-Members if paid by 5:00pm on the Friday before the event. NO EXCEPTIONS! $10 MORE IF PAID ON THE DAY OF THE EVENT. ***Pre-Registration and Pre-Payment are Required. If the event fills up there is a chance of being turned away at the door. Online registration ends Friday at 5:00 pm. Allergies to Food or Medications? As the legal guardian of the persons listed above, I recognize that potentially severe injuries, including but not limited to permanent paralysis or death can occur in sports or activities involving height or motion, including but not limited to gymnastics, tumbling, trampoline, dance, and cheerleading. 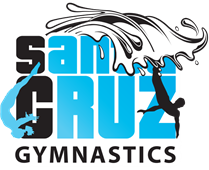 Being fully aware of these dangers, I voluntarily consent to the aforementioned person(s) participating in any and all Santa Cruz Gymnastics Center, Inc. programs and activities, and I ACCEPT ALL RISKS associated with that participation. In consideration for allowing the above mentioned person(s) to use these facilities, I, on my own behalf and the behalf of the above mentioned person(s) and our respective heirs, administrators, executors, and successors, hereby COVENANT NOT TO SUE and FOREVER RELEASE Santa Cruz Gymnastics Center, Inc. its officers, directors, shareholders, employees, or agents from all liabilty for any and all damages or injuries suffered by the above mentioned person(s) while under the instruction, supervision, or control of Santa Cruz Gymnastics Center, Inc. including, without limitation, those damages or injuries resulting from acts of negligence on the part of its officers, directors, shareholders, employees, or agents. I have read and understand this assumption of risk and waiver of liability and medical authorization and I voluntarily affix my name in agreement. In consideration for allowing the above mentioned person(s) to use these facilities, I, on my own behalf and the behalf of the above mentioned person(s) and our respective heirs, administrators, executors, and successors, hereby covenant not to sue and forever release Santa Cruz Gymnastics Center, Inc. its officers, directors, shareholders, employees, or agents from all liabilty for any and all damages or injuries suffered by the above mentioned person(s) while under the instruction, supervision, or control of Santa Cruz Gymnastics Center, Inc. including, without limitation, those damages or injuries resulting from acts of negligence on the part of its officers, directors, shareholders, employees, or agents. In the event of an emergency I would like the above mentioned person(s) to be taken to a hospital for medical treatment and I hold Santa Cruz Gymnastics Center, Inc. and its representative harmless in their execution of this action. Additionally, I hereby agree to individually provide for all possible future medical expenses which may be incurred by my child as a result of any injury sustained while participating at Santa Cruz Gymnastics Center, Inc. I have read and understand this ASSUMPTION OF RISK and WAIVER OF LIABILITYand MEDICAL AUTHORIZATION and I voluntarily affix my name in agreement. As the legal guardian of the persons listed above, I hereby consent to the use, by the SCGC Program, or anyone it authorizes, of any and all photographs, tapes, or other representations, and any reproductions thereof for the purposes of promotion (including sale, publication, display, and exhibition) without compensation. The member agrees that such materials and negatives shall constitute SCGC property, with full right of distribution.